This is a comparison of some of the larger Druid groups in North America (with information taken from each group’s own website). Group origins, culture used in worship, festivals and other aspects are covered, with specific links provided for further information. While this page is regularly updated the information here is simplified, so go to the organization webpages to do more research. If any group representative has better data, please feel free to contact me. 1- Druid Revival: starting in the mid 1600’s people in Britain – and a little later on, in several other countries – turned to what little was known about the ancient Druids as a source of inspiration and a basis for a new spirituality founded on nature and personal experience. This was the start of the ‘Druid Revival’. It is inspired by the accounts of ancient Druids, and draws on the work of historical researchers, folklorists, and early literature. Essays on the start of the Revival can be found at OBOD and at AODA. 2- Neopagan: a term that distinguishes the historical Pagans of ancient cultures and the adherents of modern (c1960’s on) pagan movements. Neopagans tend to emphasize pantheism or nature-worship, or have revived or reconstructed aspects of historical polytheism. For more interpretations or definitions of this term go to Wikipedia, and ADF. 3- Reformed Druidism: starting in 1963 as a protest against coerced religious attendance at Carelton College in Minnesota, students explored world faiths and personal paths. 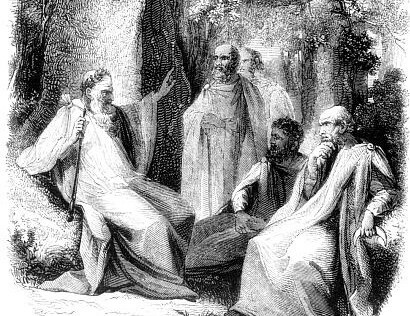 Reformed Druidry emerged, and is known for a lack of dogma, loose hierarchy, eclectic traditions, a wry sense of humor, and spawning many other groups. The term ‘reformed’ is used to recognize that members no longer take part in the alleged abuses of the ancient Druids. (Recognizing that everyone in antiquity participated in practices that are not accepted today.) Go to the RDNA archive site for their FAQs on the Reform. 4- Eightfold Cycle or Wheel of the Year: the eight seasonal festivals consist of the solstices and equinoxes – four moments during the year which are dictated by the relationship between the Earth and Sun – and the four ‘cross-quarter’ festivals which are not determined astronomically, but are related to the traditional pastoral calendar. It turns out that I have been a member of all of the Druid orders in this new table at one point or another. This Druid Group Comparison Table was originally published on 7-7-2011.